Padmasambhava, also known as Guru Rinpoche, Padmakara, or Tsokey Dorje, was the guru predicted by the Buddha Shakyamuni to bring the Buddhist Dharma to Tibet. In the land of Uddiyana, King Indrabhuti had undergone many trials, including the loss of his young son and a widespread famine in his kingdom. The Bodhisattva Avalokiteshvara felt compassion for the king, and entreated the Buddha Amitabha, pictured directly above Padmasambhava, to help him. From his tongue, Amitabha emanated a light ray into the lake of Kosha, and a lotus grew, upon which sat an eight year old boy. The boy was taken into the kingdom of Uddiyana as the son of King Indrabhuti and named Padmasambhava, or Lotus Born One. Padmasambhava grew up to make realizations about the unsatisfactory nature of existence, which led to his renunciation of both kingdom and family in order to teach the Dharma to those entangled in samsara. Over the years, as he taught, other names were bestowed upon him in specific circumstances to represent his realization of a particular aspect of Buddhism. This thangka depicts Padmasambhava, in a form also called Tsokey Dorje, as a great guru and Buddha in the land of Tibet. Tsokey Dorje, or Lake-Evolved Vajra, is always shown with the vajra, a symbol of the adamantine, or indestructible, nature of absolute truth in his right hand. His left hand holds the kapala, or skull cup, while against his left shoulder leans the khatvanga, or adept's staff. Some versions of Padmasambhava also include a phur-pa dagger tucked into the belt of his robes. Surrounding him are two of his consorts and his eight primary manifestations, all of which serve to represent a form that helps the practitioner to make realizations about his or her own nature. After Padmasambhava arrived in the kingdom of Uddiyana, his presence ended the drought and famine, and prosperity swept the land. These successes led his father to arrange Padmasambhava's marriage to the perfect wife, Bhasadhara. He was given the name Padma Gyalpo, or Lotus King. Seen in the top right corner, Padma Gyalpo grasps a mirror in his left hand and holds a damaru, or skull drum, aloft in his right. Padmasambhava soon grew disquieted as he realized that he would not be able to achieve Enlightenment if he remained King, and decided to take action. He willfully killed a young boy so that according to Indian law, he would be exiled. The child was destined for a lower rebirth due to his accumulation of bad karma, but through Padmasambhava's action, he was instead reborn in a Buddha's paradise. Padmasambhava was consequently expelled, and was free to pursue his enlightenment. In the charnel field of Cool Grove, Padmasambhava wore the cotton shrouds of the dead and ate the rice offerings left for the deceased. As he progressed through his yogic practice, he attained the ability to subjugate the dakinis into serving the Buddhist Dharma. One source goes on to explain that Padmasambhava assumed a terrifying form at this charnel field known as the Rakshasa demon, described as wearing human skin and holding a bow and five iron arrows. Padmasambhava traveled to the country of Baiddha, and went to the charnal field known as Bodies' End. At the center is the Mount Potala stupa, from which he instructed the dakinis for five years, and was given the name Nyima Odzer, or Golden Light of the Sun. Nyima Odzer carries the khatvanga in his right hand and from his left hand emanates the rays of the sun. He is pictured directly below Padma Gyalpo, and is usually portrayed as a mahasiddha, looking somewhat emaciated. Padmasambhava, as Nyima Odzer, traveled to Kashmir to the charnal field of Radiant Beatitude to share the Dharma with the dakinis there. It was in this setting that Nyima Odzer realized the manifestation named Loden Chogsed, however, there are two versions of this attainment. The first version explains that while Nyima Odzer was teaching, a murderous man was sent into the cemetery with his victim, whom he had killed because after a dispute over ownership of a cow. Nyima Odzer tried to help the man by revealing the Dharma to him, but the man did not listen. Later, the man returned to try to steal fruits from the trees in order to feed his family, but because of his resentment towards Nyima Odzer's attempt to help him, he was eaten by animals. Because Nyima Odzer had acted as father and mother, he was given the name Loden Chogsed, or Supreme Genius. 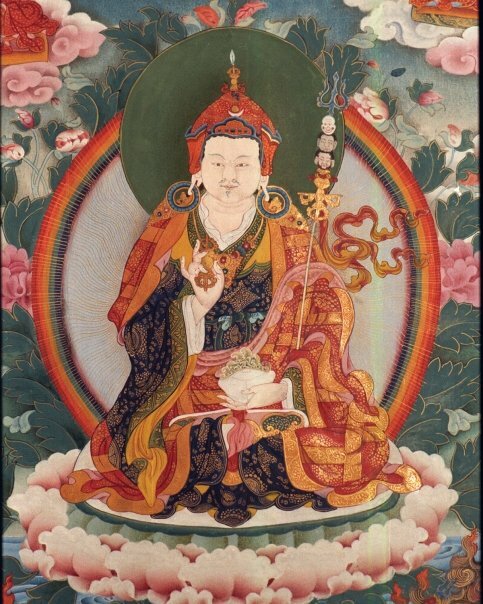 The second account of Loden Chogsed's origination relates that Padmasambhava asked the great teacher Manjusrimitra for teachings that would lead to Padmasambhava's attainment of the vidyadhara level of longevity, which would allow him to control the length of his life. Realizing that Padmasambhava should not receive the teaching form him, Manjusrimitra sent him to Sandal Grove charnal field to be taught by the nun Kungamo. She turned Padmasambhava into the Tibetan letter "hung" and swallowed him. It was inside of her body that Padmasambhava was bestowed the following empowerments: the external abilities of Amitabha and the vidyadhara level of longevity, the internal realizations of Avalokiteshvara and the vidyadhara of mahamudra, and the secret empowerment of Hayagriva, thus enabling him to subjugate all the dakinis, devas, and demons . The Loden Chogsed form is illustrated directly opposite Nyima Odzer, holding a damaru in his right hand and a kapala in his left. Padmasambhava has a form that is very similar to that of the Buddha Shakyamuni, holding a begging bowl in his left hand and either holding a vajra in his right or making the bhumis parsa, or "earth witnessing," mudra. Known as Shakya Senge, this manifestation of Padmasambhava is seen to the left of Padma Gyalpo, and also has two documented origins. The first explains that he attained this form after he, as bodhisattva Sumitra, learned from Ananda the Four Turnings of the Wheel, the Four Truths and the Twelvefold Chain. Another text finds the source of Shakya Senge emerging from a different text and teacher. Immediately after Padmasambhava renounced his Rakshasa demon form, the monk Prahabhasti conferred upon him the Tattvasamgraha and the Yoga Tantra teachings. Immediately after hearing the sutras, Padmasambhava had a vision of the thirty-seven deities of the Yoga Tantra without entering into meditation, and was then given the name Shakya Senge. 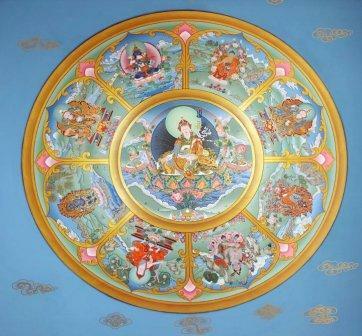 In the land of Zahor, Padmasambhava teaches and converts Princess Mandarava, daughter of the King. When the King learns of this, he has Padmasambhava and Mandarava burned alive. Instead of finding their charred corpses, the King discovers that the pyre has become a lake, out of which a lotus has bloomed. Padmasambhava and Princess Mandarava, having attained the secret names of Hayagriva and Vajravarahi respectively, are supported unharmed on the lotus bloom. The King begs for their forgiveness and Princess Mandarava realizes that she must go with Padmasambhava to spread the Dharma, fulfilling the prediction at her birth that she was a dakini of knowledge. Mandarava becomes one of Padmasambhava's primary disciples and is portrayed to his left. Opposite Mandarava is Padmasambhava's other attendant, Yeshe Tsogyal, one of King Trisong Detsen's queens. She is an emanation of Vajra Yogini, and thus shares identity of each of the consorts of the five jina Buddhas. Her dharmakaya is considered to be that of Samantabhadri and her sambhogakaya, or semi-manifest form, is Dhatvishvari. After a sojourn in the charnal field of Lankakuta where he taught the dakinis, he manifested a form known simply as Padmasambhava. This manifestation is dressed in the red hat and robes characteristic of Nyingma sect monks, and holds a kapala in his right hand while his left makes vitarka mudra. The monk form of Padmasambhava is seen in the top left corner. It was also during this time that Padmasambhava reached the stage of the eighteen Tathagatas and received the secret name of Samantabhadra. Padmasambhava decided to go to Akanistha heaven, where the Adi Buddha Samantabhadra resides, in order to learn more about the Dharma. Buddha Samantabhadra is the universal Buddha of the Nyingma sect and is considered their primary source of Buddhist knowledge. While there, he mastered the Tantras of Mahayoga, meditated on the Three Samadhis, and understood that all sound is mantra. Samantabhadra taught him how to incorporate the five jina Buddhas and empowered him as Guru Urgyan Dorje Chang, the Holder of the Vajra from Urgyan. Usually illustrated as a blue male and white female paired deity, he holds a vajra in his right hand and either a vajra or gunta in his left, while his female counterpart holds a kapala. They are shown to the left of the Buddha Amitabha. Padmasambhava left India for Tibet, and in conjunction with the abbot Santarakshita and King Trisong Detsen, established Buddhism as the dominant religion. Santarakshita brought with him from India the sutra texts and the moral precepts of Buddhism, while Padmasambhava carried the inner tantras and the secret mantras. Padmasambhava used his power to subjugate demons into the service and protection of the Dharma. Padmasambhava also prompted the translation of Buddhist texts from Sanskrit into Tibetan to encourage the spread of Buddhism. Monks from India and Tibet worked together to transliterate the Mahaparinirvana sutra, a short version of the Prajnaparamita text, as well as three parts of the Tripitaka: the Vinaya, the sutras, and the Abidharma. Throughout his years in Tibet, Padmasambhava wandered the land with his primary consort Yeshe Tsogyal, who carefully recorded his teachings. These texts were sealed in secret spots, such as rocks, monasteries, and images to be later revealed for the sake of future beings following their paths to enlightenment. The concealment of these teachings, called terma, maintained not only the purity of the texts, but also kept the Nyingma lineage faithful. Yeshe Tsogyal mastered each of Padmasambhava's teachings, and followed the path of esoteric Vajrayana. She thus became an enlightened being, left the cycle of samsara, and vanished directly into Padmasambhava's heaven realm, Copper Mountain Paradise, rather than suffering through the death process. Dorje Drolo is the fierce form that Padmasambhava adopted at the Tiger's Lair charnal field. This form is known as the subduer of demons and the guru of consolation. In Dorje Drolo's right hand he holds the vajra, and a phur-pa ritual dagger is grasped in his left as he rides a tiger. 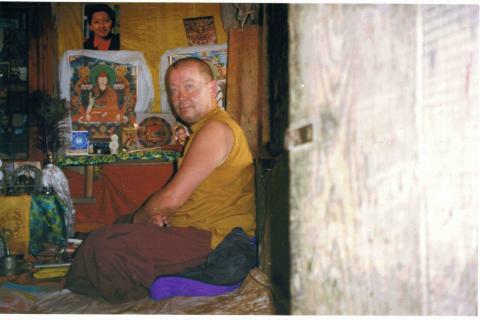 He is seen in the bottom right corner adjacent to a Nyingma monk. This fierce form exhibits the energy and power a practitioner has available to him or her in order to clear from their path any obstacles on the way to enlightenment. Another energetic form of Padmasambhava is Senge Dradrog, He Who Teaches With A Lion's Voice. In Nepal, he taught the dakinis for five years, and also subdued the eight classes of gnomes, reduced three worlds, and subjugated three domains. Senge Dradrog wields a vajra in his right hand, and is endowed with greatest power in the three levels of existence. This form is also documented as manifesting after Padmasambhava won a debate at Bodhgaya and is visible here in the lower left corner. The sealing of terma manuscripts in caves, monasteries, rocks and statues serve to preserve the integrity of the teachings as well as the purity of the lineage. Each terma contained a highly esoteric tantra written in a single, practical form, and often accompanied by additional teachings or ritual objects. The series of texts served as a guide to enlightenment, so all future beings would have pure texts to learn from. Padmasambhava made predictions of who would unearth them at the proper time, those people being almost always later incarnations of his most accomplished disciples. Tsogyal, Yeshe. (Trans. Erik Pema Kunsang) The Lotus-Born: The Life Story of Padmasambhava. .Boston: Shambala, 1993. Dowman, Keith Trans. Legend of the Great Stupa.. Berkeley: Dharma Publishing, 1973.